Long hours at a desk, too much time in the driving seat and not enough exercise make the UAE a hotspot for back problems. What’s On went to the newly-opened Pure Chiro Dubai clinic in Media City to seek the expert help of Dr Nashila Farrah Jaffer and Dr Mitra Chini. What does a chiropractor do? A chiropractor focuses on the alignment of the spine and nervous system. We use gentle and precise adjustments to re-align the spine, relieve irritation to the nerves, improve mobility in the joints and relax muscle spasm. What are the issues you see most often with patients in Dubai? We commonly see a lot of postural problems resulting in lower back, neck and shoulder pain. Our lifestyle in Dubai involves long hours at a desk, prolonged sitting in cars and lack of exercise, all of which has a great impact on the spine, causing strain on muscles, joints and discs. Do you only deal with back pain? Not at all. Common treatable conditions include headache, migraine, neck and shoulder pain, sciatica and sports injuries. What are the warning signs that should alert people that they might need to see a chiropractor? Pain is the first warning sign, but before this you may feel tension, stiffness or lack of movement in your neck or back. Can you turn your head and look over your shoulder? Are your shoulders level? Are your hips level? 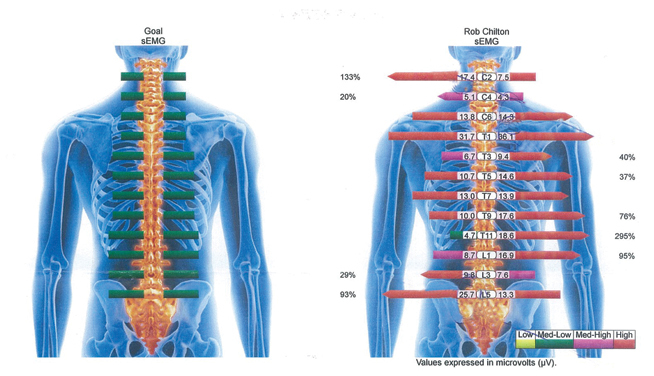 These postural imbalances are all signs of spinal misalignments, which can be corrected with chiropractic care. After a chat about our aches and pains and posture issues, Dr Jaffer uses two scanners the size of mobile phones to take readings of our back. The image flashes up on a computer screen (see below). Strong muscles and good alignment are represented by short green arrows (below, left). The fact that our scan (below, right) features long red arrows is not good. We clamber onto the treatment table and Dr Jaffer gets to work using trigger point therapy. This is not the kind of massage treatment you get at a spa – there are no fragrant oils or the sounds of a rainforest in the background at Pure Clinic. This is an elbow, carefully aimed at the centre of a problematic muscle to ease the spasm and get the blood flowing. Further examination reveals our neck muscles are tight. Dr Jaffer takes our head in our hands, tells us to relax and then, with a swift flick of the wrists, jerks our head to the side to produce several satisfying clicks, before repeating the process on the other side. This is just step one of a course of treatment but, as first steps go, it’s a cracker – literally.